It’s not like you really need another dip recipe. Not only are there old standbys, but there are some really gorgeous looking alternatives out there this week. So these two recipes, variations on a couple of heavenly looking dips in Marie Claire Seasonal Kitchen, are really overkill. But, they are so good, I hope you try them anyway. First off, I give you carrot dip. Now, I was lucky enough to make mine from carrots that were pulled from the ground yesterday. Can you imagine? 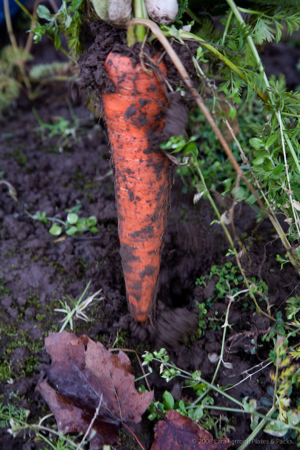 In January, you can still harvest carrots. And these were true beauties. Big, thick brilliantly orange sticks that smelled like earth and sunshine. Just washing off the caked mud was enough to make me swoon. And, when I saw the beet dip recipe, with its deep scarlet color, I knew that I could get gorgeous results with carrots instead. A bit of reduced blood orange juice (you can use any oranges or even meyer lemons if you want) makes the dip all the more vibrant, both in flavor and color. 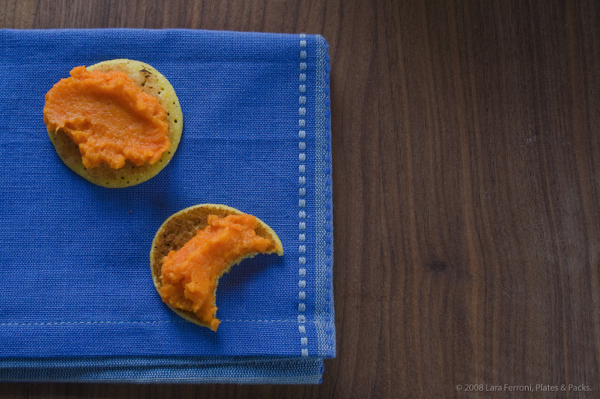 I smeared my dip on little polenta-garbanzo bean flour blinis, which I adapted from a recipe that I shot for this Epicurious article last fall (the panna cotta recipe is lovely by the way). But, this dip would work equally well with pita, crackers, celery or a nice crusty french loaf. I hadn’t actually meant to make two dips, but sitting right next to Seasonal Kitchen’s beet dip recipe was an Italian white bean dip that I couldn’t resist. 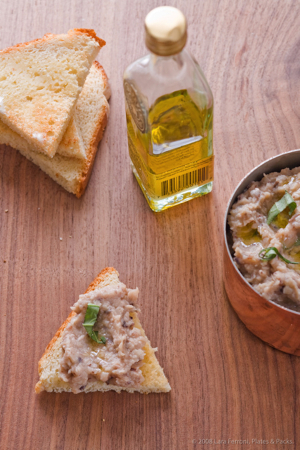 My version replaces the white beans with black eyed peas, adds a bit of meyer lemon and leaves out the tuna for a veg friendly dip. A drizzle of truffle oil or a good salad-quality oil and a sprinkle of basil easily pushes this dip into the favorite category and a nice change from the usual. Again, crackers or crusty Italian bread would be lovely, but I just made some little toast triangles from bread I had at home. Makes one good sized bowl full. Peel the carrots and slice into 1 inch chunks. Place them in a baking dish and fill about 1/2 way up with water. Add the cardamom pods and bay leaf. Cover with foil, and bake for about an hour or until the carrots are very soft. Remove the carrots from the baking dish and let them cool. Mix the juice from the orange with the sugar in a small sauce pan and heat over medium-high until the liquid reduces by about half. Let cool. In a food processor, blend the carrots until they are smooth, adding a bit of the reduced orange juice if it gets to thick. 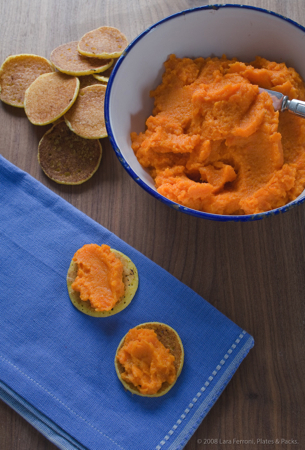 Transfer the carrot puree to a bowl and add the yogurt and remaining reduced orange juice. Stir to just combine. Season to taste with sea salt and black pepper. In a medium sized bowl, mix together the garbanzo bean flour, polenta, baking powder and salt. Add the egg and stir to combine until all the flour is moistened. Add the yogurt and milk. Let the mixture sit for 15 minutes. Heat a griddle to medium heat and lightly brush with olive oil. Drop small spoonfuls (a bit smaller than 2 inches across) of batter onto the griddle. Let them cook until you start to see small bubbles bursting throughout and the edges just start to pull away. If the griddle is to hot the blini’s will rise more in the middle and get a bit weird looking so reduce the heat. You don’t want them to rise too quickly. Flip and cook on the other side for about the same amount of time. Let them cool on a baking sheet (it’s best not to stack them when they are hot). Note: You need to start this recipe the night before you want to serve it, or use canned black eyed peas. Place the dried peas in a bowl and cover with water. Let sit over night. Drain and rinse the peas and place in a heavy bottom sauce pan. Add the vegetable stock, cover and cook on low for about 1 hour until the peas are quite soft and have lost any of the mealy texture. Remove from the heat and let them cool. Put the softened peas into a food processor with the olive oil, and juice from the lemon. Blend just a little until the oil has been incorporated and the peas have broken down a little. Don’t blend too much though, you don’t want a paste. Place the puree in a bowl and stir in the basil leaves. Salt and pepper to taste. Drizzle with your choice of oils. This entry was posted in Cookbooks, Food, Lunch, Recipe, Savory, Side. Bookmark the permalink. Thanks for the healthy dip ideas. 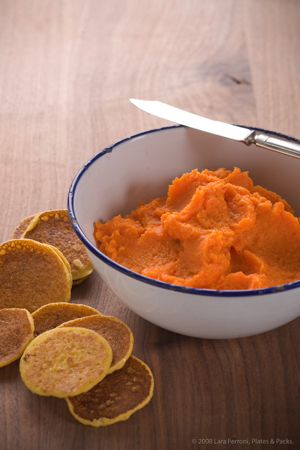 The carrot dip looks wonderful and I bet it was pretty tasty on those yummy looking blinis! 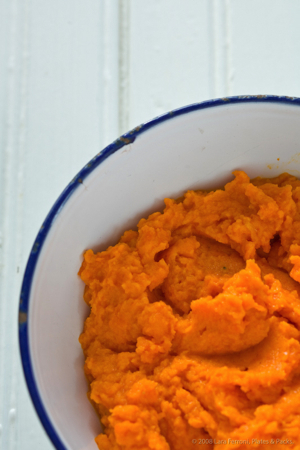 That carrot dip looks and sounds absolutely divine. I might have to try it this weekend…lucky for me I have all the ingredients on hand!! Those carrots are just gorgeous. That’s one vegetable I’ve never tried growing myself. Both these dips sound delicious and just unusual enough to be very interesting! 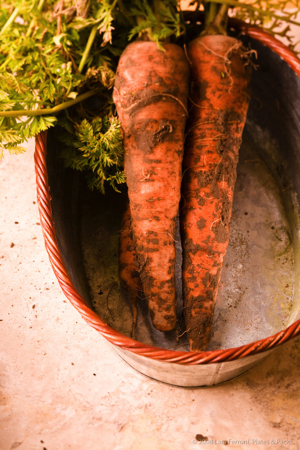 Do you grow these fab carrots? 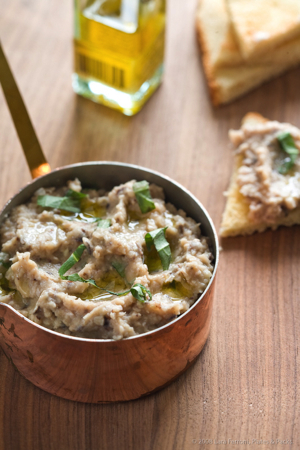 I have a part Romenian in me end my papa used to make a white bean dip with lots but lots of garlic and black pepper. MMMmmmmmmmmm. Carrot dip, yum yum. I’m going through a bit of “carrot” phase at the moment. I’m game for any dish which uses them. Will bookmark this recipe. Thanks! Looks great, both the dips. I do a white Lima bean dip regularly using it as sandwich spread. In stead of the basil, try broad leaf parsley, mint or coriander. Together with a pinch of chili, ground cumin or coriander it works wonders. I like the carrot dip idea very much. There’s a tune in my head playing “healthy bites, healthy bites”:)). I would also add some apple purée to that dip. Does that sound as a wrong flavor mix? Both sound overwhelmingly delicious! I like carrot juice so I’d probably like carrot dip! Love your site. I found a few weeks ago and just bookmarked it. Cheers and here’s to dipping! Oh your carrots look lovely! Ours haven’t even started to really grow yet and we’re so anxious. When they do finally get big, we’ll have to try this for our vegan friends! The dips all look gorgeous, but of all these gorgeous dips, this is the one that calls out to me the most: Meyer Lemon and Black Eyed Pea Dip. Wonderful combination. These dip recipes are beautifully inspired. 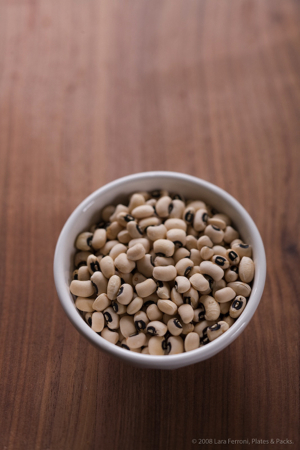 Black-eyed peas have a sweet nuttiness that must be delicious with the Meyer lemon. Guess I need to make this soon!